When I was a child my father gave me a wooden puzzle that consisted of pieces that represented every possible combination of 5 squares. The goal was to arrange the pieces in various rectangular blocks for example 3x20 if my memory serves me correctly. The pieces might have to be turned upside down in order to make the rectangular blocks. Even now when staring at tiled floors I cannot help but see these patterns. What is the name and history of the puzzle and where can I find the list of pieces and the solutions? They are called pentominoes. Because dominoes are 2 squares joined together, pieces made from more squares were dubbed trominoes, tetrominoes, pentominoes, hexominoes, etc. They were popularised in a book by Solomon Golomb, and more so after Martin Gardner devoted some of his columns in Scientific American to them. It is called pentomino, yon can see the description and solutions in Wikipedia or google additional information. Not the answer you're looking for? 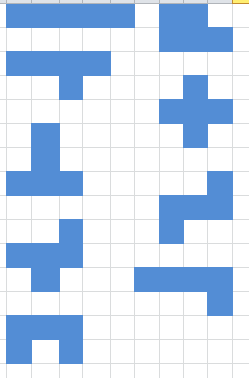 Browse other questions tagged geometry puzzle-identification tiling puzzle-history polyomino or ask your own question. What is the minimum number of line segments that need to be made to cross all points on a $n \times m$ grid?